If you’ve been checking out Pelotons in the wild on instagram lately, you’ve probably noticed some cool grey towels on the handlebars. Curious what they are and what you’ve been missing out on? They are spintowels! Courtney and Dave are home riders who have created this masterpiece and the coolest custom Peloton product I’ve yet to see. This towel slips perfectly on the handle bars and protects your precious bike from your hard earned perspiration (and even more importantly that of the other riders in your household). 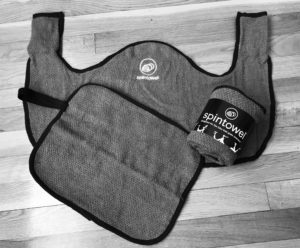 It also comes with a matching small towel for your face and body, that has a super smart loop to keep it at the ready on your handlebars. Get yours here and receive a 10% discount on your first order with code ‘PELOTONGUIDE’.